The Trueline 250 APT (air pressure tank) 5 gallon striper is an easy to use factory floor, parking lot or field striper. This unit is great for companies that have easy access to compressed air. 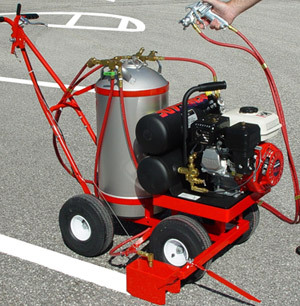 One charge will spray 5 gallons of paint which is enough for about 2000 feet of 4″ striping. We recommend this unit to our customers who want to stripe factory floors. It is a very low maintenance machine with no moving parts to break. Units are in stock for quick delivery. Order below online or call 850-934-3157. Regulator with dual 160 psi guages. One shows the amount of air pressure in the Reserve Air Pressure Tank and the other for operating pressure. The Trueline 250 EC and 350 EC (electric air compressor powered) 5 / 10 gallon stripers are simple and capable paint stripers that can be used to stripe factory floors, parking lots or fields. The 250 is a 5 gallon machine and is the more popular unit. The 350 is the 10 gallon machine and is normally sold to companies who will be striping roads, airports or other large jobs. Both units are great for companies that have access to electric power either from a plug or a generator. To use the machine you simply plug it in for a couple of minutes until the main tank is pressurized. Then you unplug it and begin striping. 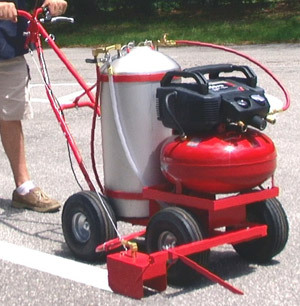 One charge on the compressor will spray up to 10 gallons of paint. This is a very low maintenance machine with very few moving parts to break. Units are in stock for quick delivery. Order below online or call 850-934-3157. The 250 EC and 350 EC machines both use the same high powered air compressor for power. Once nice feature of this machine is the fact that you can use the air pressure from the unit to power anything that runs off of compressed air such as a small hand sprayer for painting stencils. Also, like all the Trueline stripers, the unit is very quiet while striping. Electric compressor pack with 6 gallon air tank, 2.6 SCFM compressor, regulator, dual gauges and safety relief valve. Durable, maintenance-free pump/motor. Pneumatic drill, separate airline, and power mixing paddle for mixing the paint. Deluxe 13 piece air tool kit for other air applications. The Truelin e T-2000 – Available only from the factory by calling 800-327-8859. Trusco’s top of the line paint striper. 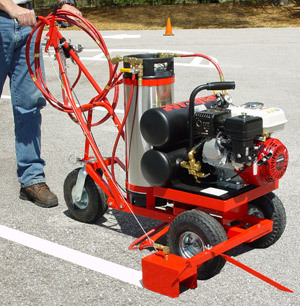 This model is powered by a Honda engine and comes from the factory with airless striping and a built in air atomized hand gun that is great for spraying bumpers, stencils, handicap logos and almost anything else. This capability allows you to stripe a line and then spray an arrow without having to reconfigure the machine. Like all the Trueline models, the T2000 is dependable and stays on the job and not in the shop. If it ever needs repair you can normally take care of it yourself. No need for expensive repair bills. The T2000-5 is a 5 gallon machine and is the more popular unit. It comes with a swivel (lockable) rear wheel which allows you to easily stripe sharp curves in parking lot or on roads. The T2000-10 is the 10 gallon machine and is normally sold to companies who will be striping roads, airports or other large jobs. It comes in a 4 wheel model only. Both self contained units are great for companies that need to be able to stripe anywhere. This machine is available through the factory only . Their number is 800-327-8859. To use the machine you simply crank the Honda engine and pressurize the main tanks and the paint tank. Then you can shut off the engine and begin striping. This allows you to stripe with no noise and no fumes which is important for indoor striping in factories or warehouses. One charge on the compressor tanks will spray 5 gallons of paint. A gallon of gasoline will allow you to stripe all day. This is a very low maintenance machine with very few moving parts to break. Units are in stock for quick delivery. Once nice feature of this machine is the fact that you can use the air pressure from the unit to power anything that runs off of compressed air such as a small hand sprayer for painting stencils. Also, like all the Trueline stripers, the unit is very quiet while striping. Pneumatic Drill and Power Mixing Paddle for mixing the paint. Regulator with dual 160 psi guages. One shows the amount of air pressure in the Reserve Air Pressure Tanks and the other for operating pressure. There are two hand sprayers that can be added to your Trueline Striper. The first is the model 523. 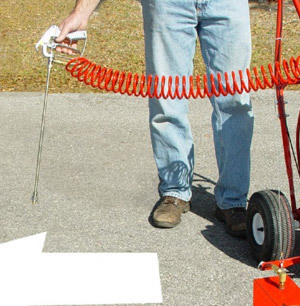 It is a heavy duty sprayer and comes with 25 ft. of retractable paint line, 2 spray tips, and an 18″ brass extension for spray assembly. 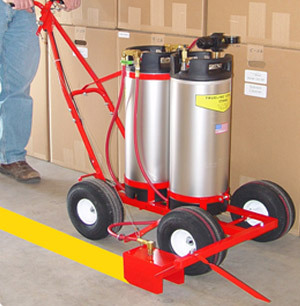 The second is the model 258 which is a lighter duty sprayer and less expensive. 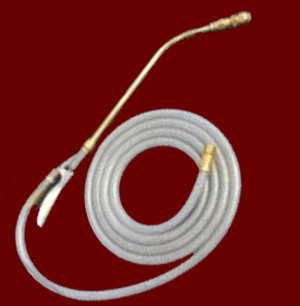 It comes complete with 10 ft. of paint line, 2 spray tips and a 24″ brass extension for spray assembly. Both sprayers attach to your machine via the port that you would use to evacuate the paint from the main tank. To activate the sprayer just turn on the valve and squeeze the trigger. Paint will flow to the spray head and create a spray pattern for curbs, arrows and car stops.